Hello all My Crafty Friends - Happy Sunday! 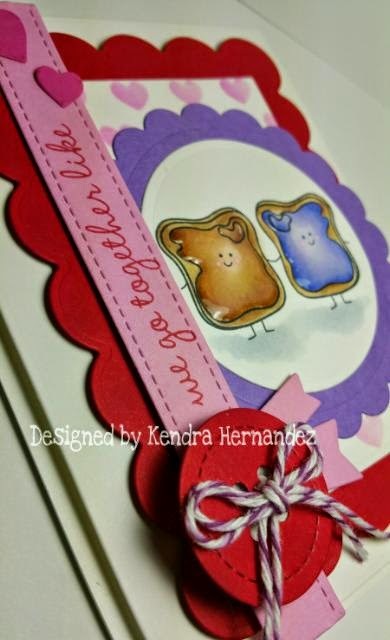 I think I've created my most favorite valentine yet using this supah cute stampset from Lil' Inker Designs....OMG aren't the peanut butter and jelly sandwiches just the cutest things ever?! I saw a card on Instagram not too long ago designed by my friend Lisa Henke, and her card is the reason that I purchased this set! Thank you for stopping by and I hope you enjoyed my design. I'll be back in a few days with some more projects I have been working on! Have a fabulous Sunday! 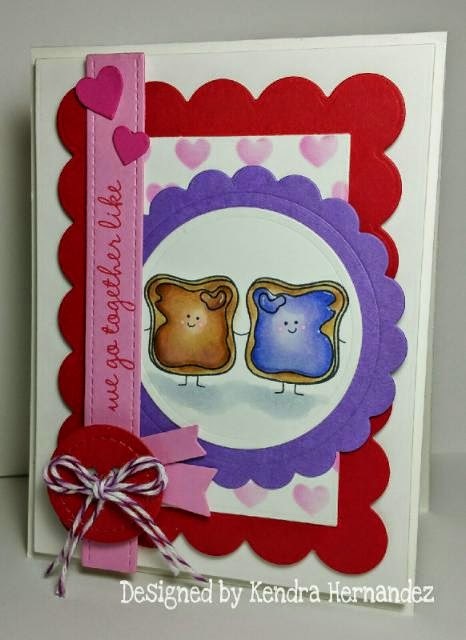 Hello and Happy Saturday Morning Crafty Friends, I'm back with another super cute Valentine's Day card to share with you. I'm Guest Designing for the next few days over at the Trendy Twine Blog and have been putting together some great projects. 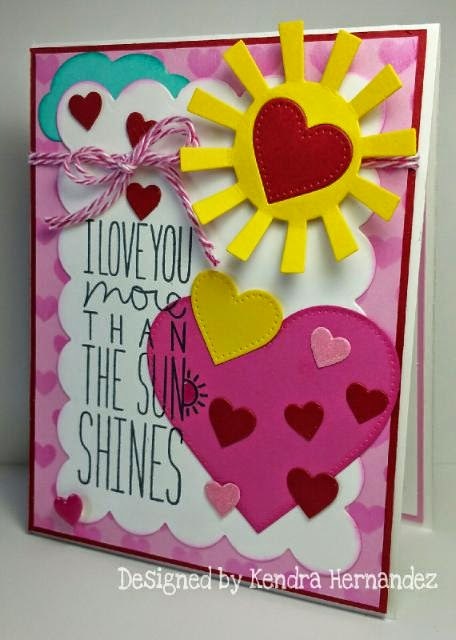 I put together this fun and colorful card using Strawberry Cupcake Trendy Twine to "tie" it all together. 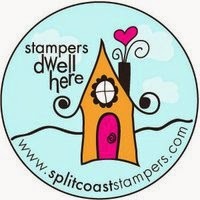 I'm LOVING this stamp set and fabulous Dienamics from MFT Stamps!! 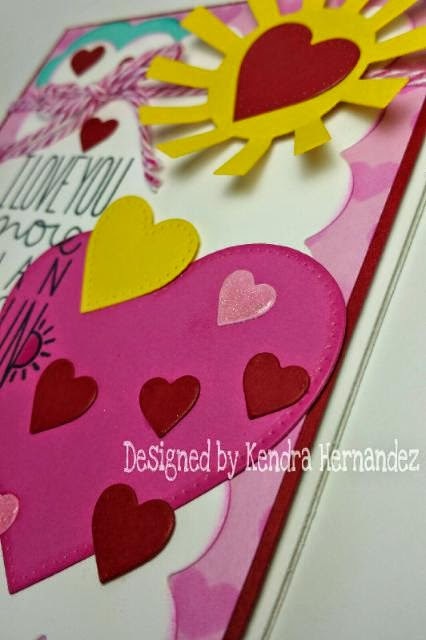 I decided to place the heart diecut in the middle of the sun and run it through my cuttlebug, then diecut another heart from the red cardstock and place it inside the sun...I love it...I think it just pops! 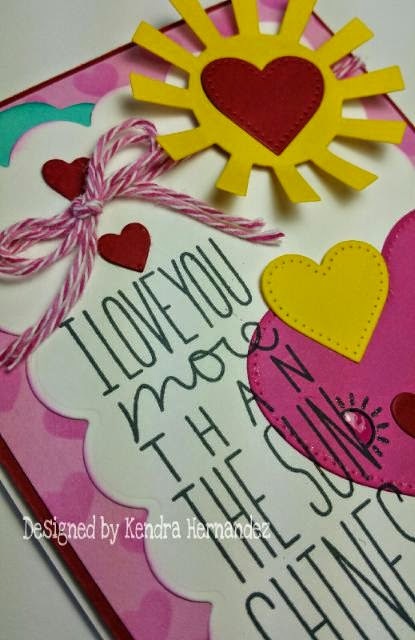 I used the MFT Staggered Hearts Stencil for the background - I soooo love this stencil - a little bit of ink on my Ranger Blending Tool and voila! I'm Guest Designing for the Trendy Twine blog for the next couple of days! The sweet and gracious Lesley approached me several months back and asked if I would be interested in Guest Designing, I told her I would be honored to hang out with all the lovely trendy twine ladies for a few days and share a few of my creations using that YUMMY baker's twine! 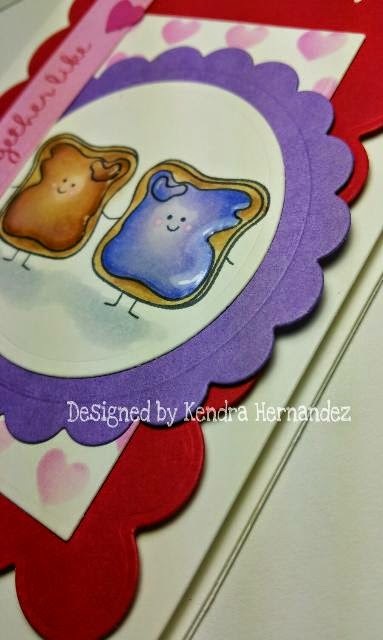 I am loving how this card turned out - and I love shakers! 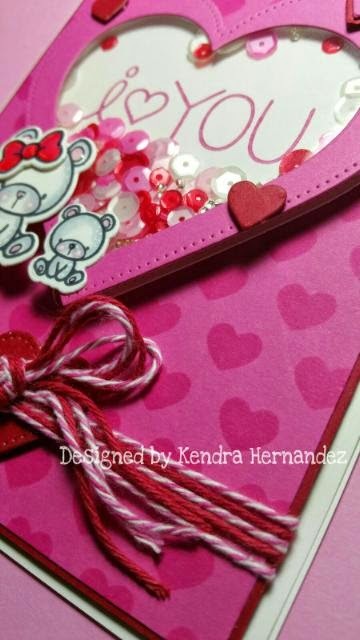 I love designing for Valentine's and this is one of my favorite color combinations. 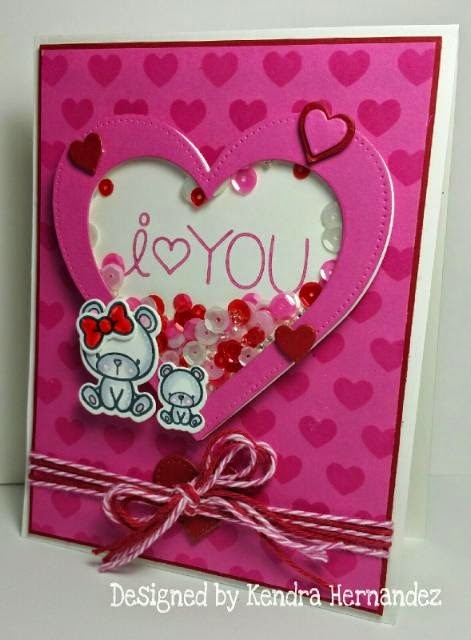 I designed this card using the MFT I Love You More and Mama Elephant Carnival Cupcakes Stampsets. For the Shaker Heart I used the MFT Pierced Heart Stax, Pretty Pink Posh Sequins and some 3M foam double sided tape. I polished off the card with Trendy Twine's Totally Red and Strawberry Cupcake baker's twine....love this stuff! They have 81 different "flavors", if you don't have any of this fantastic baker's twine run on over and grab some - I posted the link below! 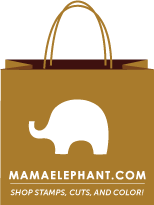 Don't you just love the little bears from the Mama Elephant Carnival Cupcakes set?? I've had this set for quite a while and thought it would go perfectly with this Valentine shaker! These colors just go perfectly together and I think the baker's twine really polishes it off!! Thank you for stopping by and have a fabulous day! 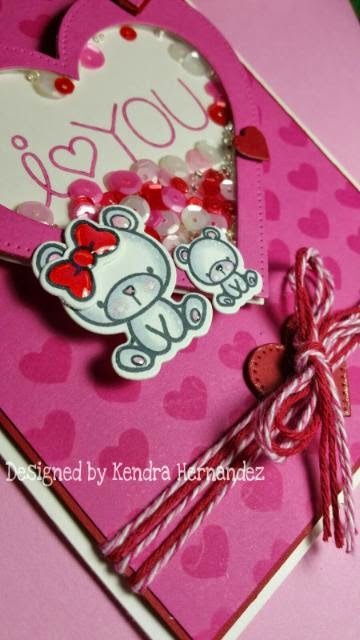 I will be back tomorrow with another yummy Valentine design.